Before we went hiking above King Cove, we had talked to the harbor master and he’d confirmed our supposition that the “light and variable” forecast was unusual for that time of year. None of us thought an opportunity like that would come again that summer/fall, so we planned a direct passage to Unalaska Island, heading out early the next morning (September 2, 2014) in order to catch the tides through Akutan Pass by mid-morning on September 3. We slipped our mooring lines in the dark at 4AM and puttered out in a dead calm, quite different from our entry into King Cove. Once outside we felt a light wind, so raised main and jib for a pleasant sail past the end of the Alaska Peninsula. We’d so enjoyed our time on this wilderness tongue of land that we were sad to be going, but new experiences awaited in the Aleutian Islands, plus reunion with some good friends! Unimak Island’s Ikatan Peninsula actually hid from view the strait separating mainland from island, even though we were staying fairly close inshore. Usually we make an offing quickly on passages, but on this one we wanted to see something of Unimak’s landscape and wildlife. The King Cove harbor master had told us that fishermen had reported seeing walrus near Cape Pankof (on the end of the Ikatan Peninsula) and Cape Lazaref (at the eastern end of Unimak Bight) so we were especially looking out for them! Unfortunately the walrus seemed to have moved off, but we did see masses of puffins nesting in the cliffs, resting on the waves, and skittering into flight. A little further on we sighted the wreck of the steamship Oduna, dashed onto the rocks in November 1965, a reminder of just how lucky we were to be traversing this stretch of water in such fine conditions. Overcast skies kept us from seeing the peaks of the island’s mountains, but we were treated to some vast vistas of tundra, cliffs, and waterfalls. We both wished we had indefinitely good weather so that we could anchor and explore ashore. But it was still a treat to see from the water. As we passed Cape Lazaref the skies began to clear and we were treated to a huge snow-clad mountain rising above the rock pinnacles of the cape. Then it was time for Seth to turn in for his afternoon watch below. I kept us sailing along the coast of Unimak Bight for a while longer, hoping for a view of Mt Shishaldin, a moderately active volcano that rises 9,373ft right up from the sea. It’s the largest peak in the Aleutians. 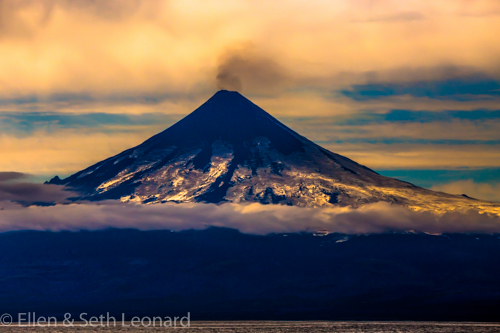 Around sunset I was lucky and the clouds blew away from its top, leaving one of the most surreal sights I’ve witnessed at sea: the glaciated mountain silhouetted against the orange clouds, a band of low cloud bisecting it, and a little puff of ash rising into the sky above. I took a few photographs from Celeste‘s swaying deck and then changed our course to stand further out to sea and get more on track for Akutan Pass. Just as I was doing so, a peregrine falcon landed on Celeste‘s spreaders! I love these beautiful mountain birds and was so surprised to see him out here, but of course we were close to a mountain environment. He kept slipping on the smooth aluminum so eventually flew off back to land. As the afternoon wore on and the land receded, the wind increased for perfect sailing on a beam reach. Eventually darkness fell and it was time for Seth’s night watch. The wind rose gradually during his watch so that when I took the deck around 01:30, he’d put a reef in the main. By that point we were beyond Unimak Pass, the main entrance to the Bering Sea but not one recommended to us by fishermen and other people with local knowledge on account of its strong currents and confused sea states. The night was very dark because thick clouds had gathered and blocked out any moon and starlight. I kept us on course south of the Krenitzin Islands, but the wind was shifting more and more on the nose so that eventually Celeste was hard on the wind to keep her course. The true wind speed was also rising, so that, combined with the increased apparent wind, it was definitely time to take in two more reefs. I turned in at 05:30 and fell right asleep (I love Celeste‘s snug sea-berths!). I woke once when Seth turned on the engine: the wind had died, which was actually quite fortunate for entering the Bering Sea. The passes between the Aleutians are known to be fearsome: the islands are relatively tightly packed; the volume of water that moves between the Pacific Ocean and the Bering Sea on each tide is not small; and so the currents run strong. Standing waves develop with even the slightest bit of wind-against-current, so we had been careful to time our approach with slack tide. We entered Akutan Pass around 09:00 and everything went perfectly for the first half: a one-knot current in our favor and dead calm seas. Suddenly, halfway through, the wind picked up from Force 1 to Force 5 within seconds, and from the north, the wrong direction! The current was also starting to run faster, so we suddenly had 20 knots of wind against a 3-knot current. Steep chop formed fast and standing waves were breaking on each side of the main channel. Fortunately we only had to content with the chop in the center of the pass, and Celeste made it through easily enough despite some shaking of her hull and rigging as she pounded into the waves. Then we were through and into the Bering Sea! That afternoon we sailed into Unalaska Bay, clouds low on the surrounding mountains, the port of Dutch Harbor opening to starboard. Dutch Harbor is probably best known from the TV series Deadliest Catch, about the Bering Sea crab fishery. We were bound for the small boat harbor at the head of the bay, in the town of Unalaska. Soon we were there, tying up Celeste and greeting our wonderful friends Andy and Daneen who’d been the impetus for our visit to Unalaska and who’d very nicely volunteered to look after Celeste all winter. We can’t thank them enough! Categories: Alaska Peninsula, Aleutian Islands, Arctic Voyage | Tags: Adventure, Alaska, Alaska Peninsula, Aleutian Islands, Bering Sea, Bird Photography, Birding, Birds, Explore, Friends, Nature, Ocean, Outdoor Life, Passages, Photography, Sailing, Sailing around the world, Weather, Wildlife | Permalink. Great photos that really show how grandiose the landscape is up there! Love the falcon in your spreaders too. You feel so privileged when wild birds feel safe enough to land on your vessel. We had this happening with white terns at Lord Howe and it was a highlight. Thanks guys! It is an incredible landscape—unlike anywhere I’ve been before. The falcon was a pretty neat visitor; like you say, you do feel so privileged when wild birds land on the boat. I’ve had it happen with boobies and even a little plover who was too far from land and stayed with us for days. That was magical!